Now that was a much better week of action. It was a shame to see some bad officiating impact the outcome of the games, but at least the games were highly entertaining. The games were really captivating. The fantasy performances were pretty good, but probably not as high scoring as most expected in these matchups. Here is to hoping you had some of those big performances in your fantasy lineup. Fantasy Stud: Brandin Cooks. There were not a ton of big performances in a game expected to be a shootout. Cooks was one of the few bright spots offensively, catching seven passes for 107 yards. This was his first 100-yard game since Week 11. He had fewer than 70 yards six straight games before this big performance. The Rams will need Cooks to come up big in the Super Bowl if they hope to win. Fantasy Dud: Michael Thomas. Thomas was really held in check for his standards, catching just four passes for 36 yards. You didn't expect this performance from Thomas, who had double-digit receptions and 171 yards the previous week. His yardage total was his second worst of the season. Thomas still had a tremendous season but fell flat in this one. Game Notes: Todd Gurley struggled to do much, rushing four times for 10 yards and a touchdown. He caught a pass for three yards. C.J. Anderson got a lot more work than Gurley, rushing 16 times for 44 yards. Alvin Kamara had double-digit receptions for the second time this season. He caught 11 passes for 96 yards. He found little room running the ball, though, rushing eight times for 15 yards. 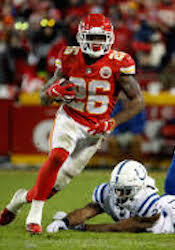 Fantasy Stud: Damien Williams. Williams continued his strong play as the lead back for the Chiefs. He had three touchdowns in this game. He ran 10 times for 30 yards and a score. Williams also caught five passes for 66 yards and two touchdowns. He had touchdowns six straight games to end his season. He made a strong case to be the lead back for the Chiefs next season. And if that is the case, he'll have high fantasy value in this offense. Fantasy Dud: Tyreek Hill. The Patriots did a great job of limiting Hill, who had just a catch for 42 yards. It was a big surprise he had just a touch in the game. This game was his lowest yardage total of the entire season and only game he had just one touch. Hill is another player that had a monster season, but this dud will likely haunt him in the offseason. Game Notes: Sony Michel had his second straight 100-yard game. He ran 29 times for 113 yards and two touchdowns. This was his sixth 100-yard game of the season. Sammy Watkins hit the 100-yard mark, catching four passes for 114 yards. He had 10 catches for 176 yards in two playoff games, returning in a big way from his foot injury.